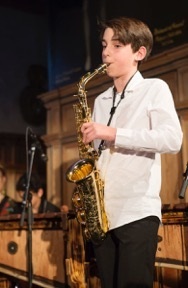 Noah Hofvander, born in Stockholm, started saxophone classes at the age of six with the Norwegian saxophonist Kristin Uglar, known from the quartet “Rolling Phones”. He already won several prizes and grants for both his youthful and mature interpretations of classical and modern pieces. In 2016 he was awarded the 2nd Prize at the Øresunds Solist competition. He performs regularly as a soloist as well as in quartets and orchestras. He is now a student of the renowned Swedish music school Lilla Akademien. You can watch Noah performing here. If you are interested in working with Noah, please get in touch with the EMCY Office.